Can you help Blueberry? She is an almost 3-year-old, 30 lb. 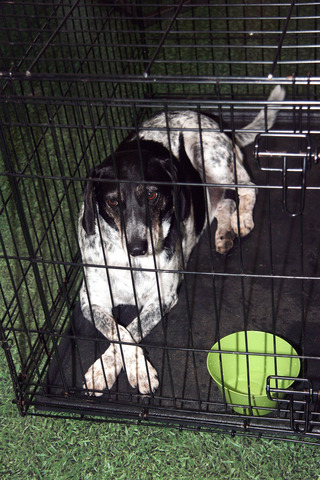 hound mix that has been at the Rockingham County Humane Society Shelter for over two years. Two years. Think about that. My animal protection group takes Blueberry to the monthly Petco adoption fair but so far, no luck. Blueberry used to be rather animated but now, more often then not, she sits calmly in her cage, observing the people come and go. It's almost like she's resigned herself to this life. There are many of us who love this sweet girl and we're willing to sponsor her and pay her adoption fee if we can find her a solid, loving home. We know she LOVES car rides (she jumps in the truck of her own accord to ride to Petco) and is affectionate. She's a little aggressive toward food, natural from being at a shelter for so long. She hasn't been around cats, so we don't know how she'd react. All in all, a sweet dog. Blueberry is in Eden, NC but there are dog transports that run across the country and I know many members of our group would move mountains to see Blueberry have the chance to experience life in a real home. If you know of anyone, anywhere, who may be interested, please have them contact the Eden Humane Society. GREAT NEWS!! Found out this morning that BLUEBERRY HAS BEEN ADOPTED! A couple who had adopted another dog from the Eden Shelter came back for Blueberry. A happy day.